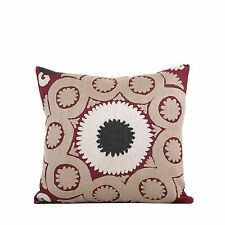 The suzani i used for this pillow cover dates back to 1950s and 1960s. They are mostly used to decorate interiors of the houses. Suzanis were also an important part of a girl’s dowry. I used natural linen with best quality for backing this pillow cover and the woven parts are all lined with felted interface fabric. 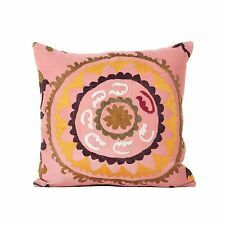 The suzani i used for this pillow cover dates back to 1950s and 1960s. They are mostly used to decorate interiors of the houses. Suzanis were also an important part of a girl’s dowry. I used cotton modern fabric for backing this pillow cover and the woven parts are all lined with felted interface fabric. 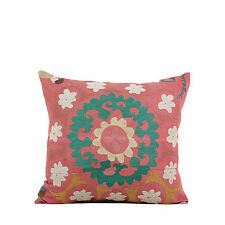 The suzani i used for this pillow cover dates back to 1950s and 1960s. They are mostly used to decorate interiors of the houses. Suzanis were also an important part of a girl’s dowry. I used modern fabric for backing this pillow cover and the woven parts are all lined with felted interface fabric.